Additionally, there are numerous blogs and articles out there which exhort you to get rid of appliances or say that one set of crockery per person is all you need. Conversely, I maintain that minimalism should not be prescriptive and that each person has different circumstances and will make their own choices. The thing that defines minimalism to me is that whatever you own is mindfully curated and limits are set. In particular, I have been reminded recently of variations in kitchen requirements. We grow some of our own food and naturally we end up with a glut of certain produce from time to time. I do my best not to waste it. Processing a large quantity of produce is generally when appliances come into their own. I can happily squeeze 2 or 3 oranges using this vintage glass juicer. But when it comes to juicing the 160 grapefruit that we have picked in the last 2 weeks I have neither the time or energy to do them by hand. My trusty food processor with the citrus juicer attachment comes into its own. This was one batch of about 60 grapefruit that I juiced last weekend. In the space of 30 minutes I had several bottles of juice for GMan plus containers of juice to freeze for future use. Citrus are not the only produce that I deal with in bulk amounts. Some time ago I bought a 20kg bag of onions. Once again, I routinely dice one or two onions using a sharp knife but the food processor with the cutting blade is invaluable for processing larger quantities of onions. I chopped 3kg of onions and then used another appliance – my dehydrator – to dry them. 24 hours later – back to the food processor, but this time with the spice grinder attachment. 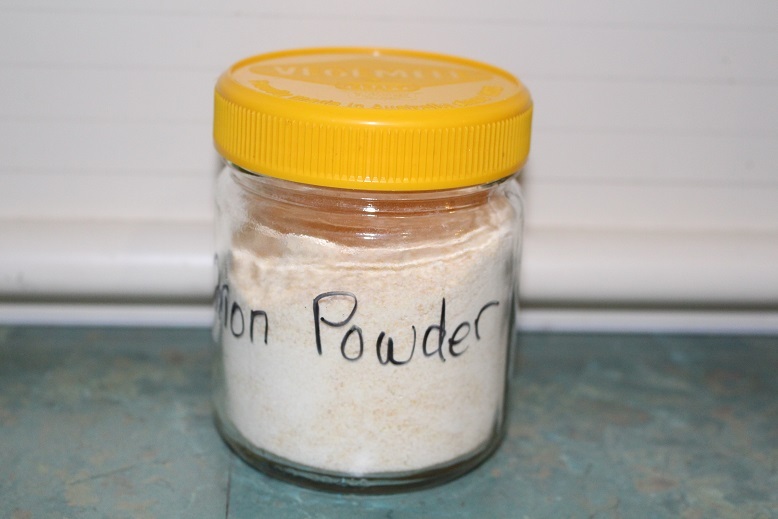 The end result was dried onion flakes and onion powder which cost me $3 and a little time as compared to nearly $13 to buy the same quantity from the supermarket. As an added bonus there is no packaging either. I have used the deydrator to make garlic powder, tomato powder and vegetable stock powder using the same general method. Then there is the Kitchen Aid mixer which I regularly use to make spreadable butter, pizza bases, combine various flours for my gluten-free flour mix, the occasional cake and GMan uses it when making sourdough bread. It also has a pasta attachment which I use occasionally. The high-speed blender is also used regularly to make smoothies, mango sorbet and peanut paste to name but a few. So, my minimalist kitchen is probably a joke in some people’s eyes but it works for me. However, I do not have single-purpose appliances such as a waffle maker, ice-cream maker, hot dog maker and so on. You see, minimalism really is what is right for the individual and their circumstances. Tonight I have a quick update on the subjects of the last couple of posts. The dehydrated onion has now been ground and here is the result. This is a 450g Vegemite jar which is about 3/4 full. While the powdered onion can be used as is, it is actually part of a bigger plan that I have. I hope to make my own vegetable stock powder and have noted that the commercial varieties have onion powder and celery powder as two of the main ingredients. Since I have celery growing quite profusely at the moment I plan to try dehydrating some celery, including the leaves as they have the strongest flavour. Watch this space for more on the progress of this venture. On the appliance front, we took some time on Monday to look for a new microwave oven. We have chosen one and I am going to buy it tomorrow. Finally, I am hoping to collect the breadmaker which has been offered to us on the weekend. Thank you all for your thoughtful responses yesterday. I have read them quickly and will go back and respond once I have written this post. As for the list from last night, here is my response. 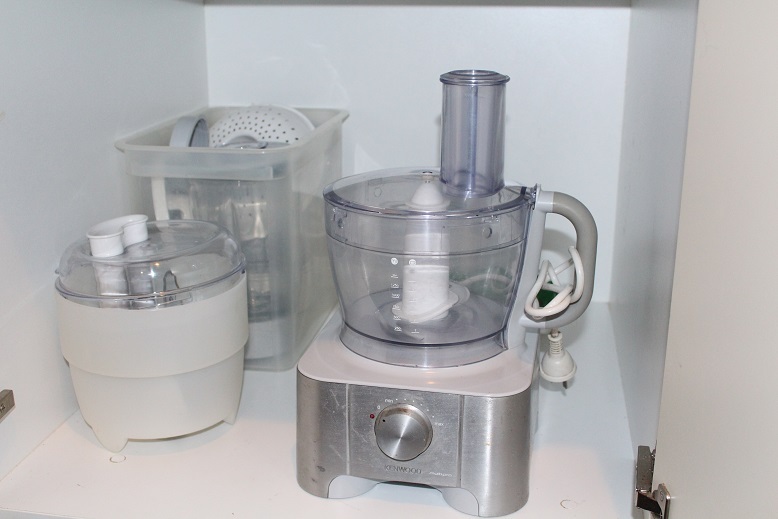 1 Blender – I have one as part of a combination with my food processor. 2 Electric Grill – we had one which we did use but when it died I did not consider replacing it. A bit of a fad, I guess. 3 Baby Food Maker – it is a long time since I was making food for babies but I have no idea what this would be. 4 Microwave oven – yes, I have a microwave but I use it less and less. If it died, I would not automatically rush out and buy another one. 5 Panini Press – I expect this is like my sandwich press which I use quite a bit. This is my food processor and all of the associated gadgets in the cupboard. The blender is with some of the other bits in the box at the back. Like most things, I do not use it to its full potential although the blender, citrus juicer, grater and slicer attachments are well-used. I also have a Kitchen-Aid stand mixer and the pasta attachment for it. 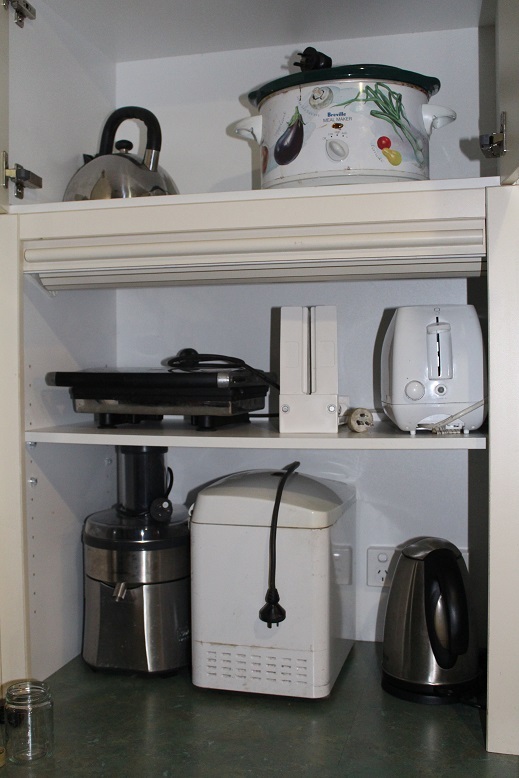 Here are the rest of my appliances in the convenient appliance cupboard. Kettle – used on the gas stove if we lose power. Also on the slow-combustion heater during winter. Slow-cooker – very well-used for soup, baked potatoes, casseroles, refried beans. I also have a stick blender in another cupboard. I have never been seduced by the single-purpose appliances such as a pie-maker, ice-cream maker, popcorn maker or hot dog thingummy but I still have plenty of gadgets. If I were to get rid of any it would be the juicer, I think. It is interesting to consider how our needs change, particularly as families grow and children leave home. Our diet and the types of food we eat has changed over the years, also. This is how clutter can become a problem – something that was essential 10 years ago is not longer required but we are loathe to move it along. 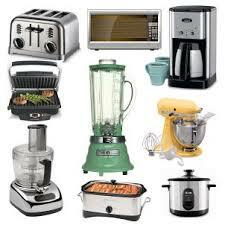 How do my appliances compare to what you have? Everyone has different essentials and priorities. 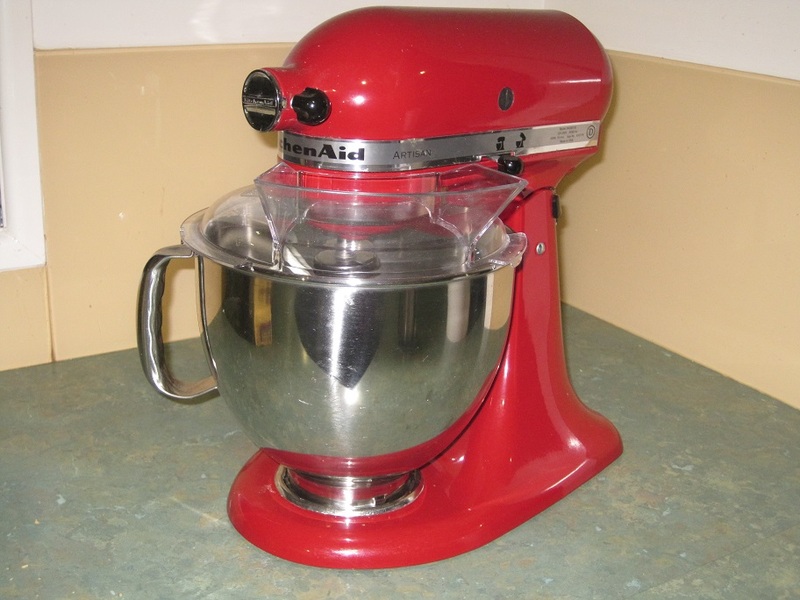 Kitchen Appliances to Keep – Or Not? I have been giving quite a bit of thought to this exact topic recently so when a friend posted the link it caught my eye and gave my a bit more to think about. I would love to hear your thoughts on what you have and why. I will be back with my own detailed response tomorrow. Keep watching for a new series beginning on Friday.